Foundation specialists and general contractors agree that one of the biggest threats to a building's structural integrity is an accumulation of water and moisture around the foundation. The entire building rests on the strength of the foundation so it's important to make sure that it's in good condition. Keep reading for six signs it's time to call a foundation specialist in Winnipeg and protect your home or building. The soil surrounding the exterior walls expands and contracts as seasons and moisture levels change. This puts pressure on your foundation and may even lead to structural damage, like cracking. 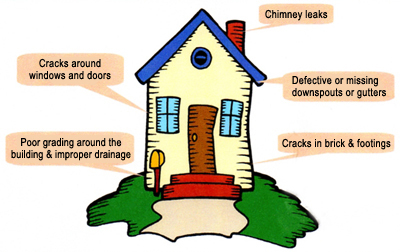 Once a crack develops, your home or building is at risk of water damage and even flooding. Another sign that your foundation may have some issues is a leaky roof. A shift in your foundation can misalign roof tiles making it vulnerable to water infiltration. If water is able to penetrate your roof, your building is at risk of moisture damage, leaks and other issues. Call a general contractor in Winnipeg right away if you suspect that water is getting in. If the soil around your building doesn't have adequate drainage, water will eventually find its way into your basement. Soil with improper drainage expands when wet, which puts a great deal of pressure on your foundation. The gutters surrounding your home help deflect water from away from exterior walls. Without them, rain water would run off the roof, down your exterior walls and straight into the ground along your foundation wall. Over time, this can cause major problems like water damage, mildew and structural damage. A large tree or bush growing too close to your foundation wall can threaten the footing of the entire building. The problem arises when the root system puts pressure on the foundation wall and pushes its way through. If left unchecked, a wayward root can do some major damage that will require the help of a foundation specialist to repair. On the inside of your home, there are several issues that may point to foundation troubles. You might find that your interior doors and windows won't close, your drywall cracks or peels or that your basement is musty and damp. Early detection is key to maintaining the condition of your foundation. The foundation specialists at Sturgeon Construction in Winnipeg can check your building inside and out to identify any weaknesses or threats to your building's integrity and correct small issues before they become big problems. Contact us today to learn more about the services we offer or to request a free estimate. At Sturgeon Construction Ltd., our foundation specialists in Winnipeg know what signs to look for to accurately diagnose and repair foundation issues. We also know that moisture is the primary culprit behind most foundation problems. Melting snow and spring rains saturate the soil surrounding a building's foundation, and without adequate drainage water will begin to accumulate or pool at the base. Moisture-soaked soil expands and begins to apply tremendous pressure against the foundation wall. Over time the foundation wall will succumb to this pressure and begin to deteriorate - eventually water will find its way through to your basement. Left untreated, any one of these conditions can lead to structural damage such as cracks in the foundation wall, which will allow water to seep into the basement. High Water Table - In Manitoba this is particularly problematic during the spring. The water table reaches its annual high point due to melting snow and spring rains. 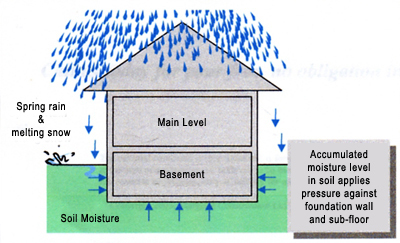 As the soil moisture level increases it applies pressure on foundation walls and under a building's sub-floor. Hydrostatic Pressure - This is the pressure exerted against a foundation wall from accumulated moisture or high water table. The more water contained in the soil, the more it expands and the more pressure exerted against the foundation and sub-floor. This pressure must be released otherwise the entire structure is subject to cracking, buckling and bulging - and water will find its way in. Settlement - The earth is a living, breathing force; the ground shifts and moves, soil compacts creating pockets of air where soil once was. With all this movement underfoot a building will react by shifting and adjusting in an attempt to support its weight. Temperature Changes - These changes can wreak havoc on any structure. With the onset of winter the ground freezes, and the clay against your home will expand, putting pressure on your foundation. In the warmer, dryer spring weather the ground thaws, relieving that pressure. This contraction and expansion puts added stress on your foundation, which can cause the foundation wall to shift and crack. Drying & Shrinkage - During the summer months Manitoba is known for its hot, dry climate. Soil moisture levels are at an all-time low, the ground cracks and pulls away from the foundation creating gaps and leaving the foundation vulnerable. Water contained in the cement mixture also evaporates over time leaving the foundation susceptible to cracking. Faulty or missing downspouts and gutters - water run-off from the roof needs to be moved away from the foundation. If downspouts and gutters are missing or not performing properly, water will accumulate around the base of the foundation leading to any one of a number of preventable problems. Insufficient grading around a building foundation - grading is the degree or ground slope around the foundation edge of a building. The purpose of grading is to ensure that water drains away from a foundation wall. Did you know that approximately 85% of homes and commercial buildings have inadequate grading? Many of the structural problems we encounter can be attributed to poor grading. 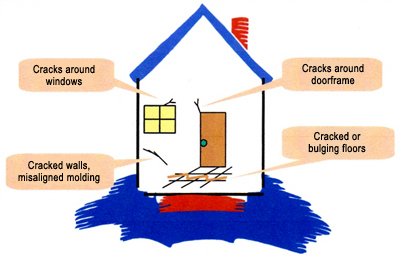 Structural cracks - if left untreated, either horizontal or vertical cracking will expand and allow water to enter the basement. If untreated for long enough, the entire building itself may require significant structural overhaul. Malfunctioning drain, weeping tile or sump pump - the primary purpose of these devices is to move water away from the foundation base. If one of these devices malfunctions, water will accumulate and the foundation is at risk. Window wells not draining properly - window wells are installed in homes where the basement windows are below grade, or ground level. These wells are installed to prevent soil from filling in against the windows. Window wells do not stop water from collecting, however they should redirect excess water out through the weeping tile. Thick shrubs, bushes or trees planted too close to the foundation wall - these can act as a barrier to natural water run-off. Many of these contributing factors are preventable. Homeowners and commercial building owners should perform a peripheral foundation check on an annual basis. To reduce the risk of structural damage, as well as spot less obvious conditions or trouble spots, it is worth having an expert review your property. At Sturgeon Construction Ltd., our foundation specialists in Winnipeg are pleased to provide a free, no-obligation inspection. Our professionals will complete a walking tour around the foundation with the building owner. We will point out any signs of trouble and offer suggestions for improving drainage. When you need an accurate assessment from an industry expert, turn to Sturgeon Construction Ltd. Let us find solutions to protect your property for years to come.